For most parents (most of the time) their children are a source of happiness and joy. But as is often the case, social science research offers a more complicated view of the relationship between being a parent and being happy. A recent study by researchers from Princeton University and Stony Brook University found little difference between parents and non-parents in terms of overall life satisfaction, once you control for factors such as marital status, income, education and religion. Another recent study from the U.K.’s Open University found that couples without children tend to be happier with their relationships and feel more valued by their partners than those with children. And Jennifer Senior’s new book All Joy and No Fun: The Paradox of Modern Parenthood explores what the author sees as a historical shift toward “child-centric” parenting and the impact this is having on parents’ happiness. 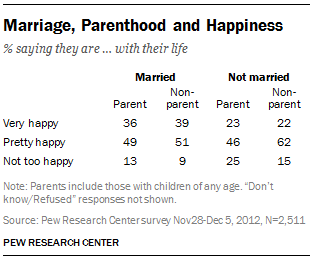 The Pew Research Center has lots of data on parenthood, marriage and happiness. There’s no doubt that these three elements of life are related—even interwoven. Our data show that there is a much stronger link between marriage and happiness than there is between parenthood and happiness. Married adults, regardless of whether or not they have children, are much more likely than non-married adults to say they are very happy with their lives. This is due in part to the fact that married adults tend to be better off financially than single people, and income and financial security are also positively correlated with happiness. Even so, marriage seems to contribute to overall happiness, even when these other factors are held constant. A November 2012 Pew Research survey found that among married adults, 36% of those with children and 39% of those with no children were “very happy” with their life. By contrast, 23% of non-married adults with children and 22% of non-married childless adults said they were very happy. Single parents were more likely than any other group to say they were “not too happy” with their life (25%). To be sure, raising children tends to coincide with middle age—a stage of life that can be stressful on many levels. Research on happiness has found that midlife can be a bit of a valley—that the trajectory of happiness takes a U-shape over the life cycle. The happiest adults, on average, are younger and older ones. Our poll also asked parents to rate the job they were doing raising their children. In general, we found that those who gave themselves high ratings as parents were among the most likely to say they were very happy with their life. The reverse was true, too. All of this suggests that, while parenthood in and of itself may not be the ticket to happiness, how mothers and fathers see themselves as parents is clearly linked to their overall sense of well-being.